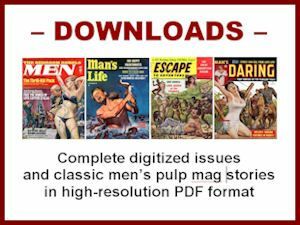 There are many connections between the classic pulp fiction magazines that flourished from the 1920s to the 1950s and the men’s pulp adventure magazines that began to emerge in the late 1940s and had their golden age from the mid-‘50s to the early ‘70s. 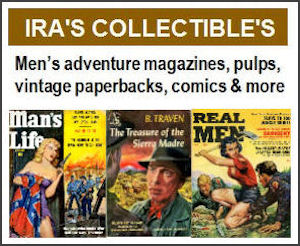 Several long-running pulps, including ARGOSY, ADVENTURE and BLUE BOOK, essentially morphed into men’s adventure magazines in the ‘50s. 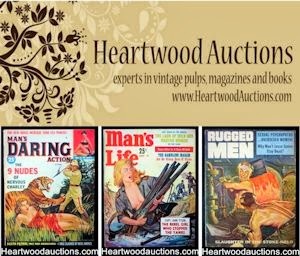 Some of the major publishers of the early pulps, like Martin Goodman and Bernarr Macfadden’s Macfadden Publications, went on to publish some of the most popular and long-lasting men’s adventure mags. Many talented artists who did cover paintings for the adventure pulps and the detective and science fiction pulp digest magazines also worked for men’s adventure magazines, including (to name just a few) Walter Baumhofer, Rudolph Belarski, Rafael DeSoto, Clarence Doore, Rudy Nappi, Peter Poulton and Norman Saunders. Many writers who worked for those types of pulps in the 1940s and 1950s also wrote stories for the men’s pulp mags. Others crossover writers are mostly familiar to pulp aficionados. 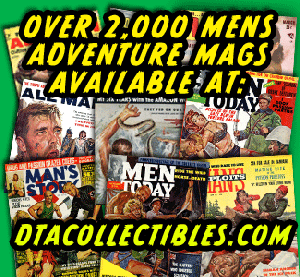 I ran across one such writer when I decided to do a deep dive into the background of some of the writers, artists and models featured in the premiere issue of the men’s adventure magazine WILDCAT ADVENTURES, published in June 1959. As noted in my first post about that issue, it is notable for having what is probably the first men’s adventure magazine cover painting done by the great Basil Gogos and an abridged version of William Burroughs’ first novel JUNKIE, illustrated by the famous comics and CRACKED magazine artist John Severin. My second post about it connected the dots between one of the “cheesecake” photo models it featured, Shirley Kilpatrick, the cheesy science fiction movie THE ASTOUNDING SHE MONSTER (1957) and the movie poster artist Albert Kallis. There’s also a story in WILDCAT ADVENTURES, Vol. 1, No. 1, by one of the writers whose work spans several pulpy genres. It’s a dark, noirish crime story titled “THE INITIATION. The author is Bryce Walton, who was born in 1918 and died in 1988. The duotone illustration for the story is uncredited and I wasn’t able to ID the artist by sight. I admit that the name Bryce Walton didn’t ring a bell with me either initially. But when I Googled it and checked my magazine collection, I realized that he was an amazingly prolific, professional pulp writer whose work I had read, although I had forgotten his name. From the late 1940s to the mid-1960s, Walton wrote hundreds of short stories for various types of magazines. One source said more than a thousand. Many of his stories appeared in science fiction and fantasy digest pulps, including: ANALOG, ASTOUNDING STORIES, FANTASTIC, FUTURE SCIENCE FICTION, IF, ORBIT SCIENCE FICTION, PLANET STORIES, SUPER SCIENCE STORIES, SPACE STORIES, SCIENCE FICTION QUARTERLY, SPACE SCIENCE FICTION and STARTLING STORIES. The Bryce Walton page on The Internet Speculative Fiction Database lists over 100 of his science fiction and fantasy stories. If you look at the covers and tables contents of the mags those stories are in, you’ll find him in the company of some of the greatest writers of speculative fiction, such as Poul Anderson, James Blish, John Brunner, Arthur C. Clarke, Gordon R. Dickson, Harlan Ellison, Randall Garrett, Mack Reynolds, and Robert Silverberg. Indeed, the editors of those magazines considered him to be popular enough at the time to feature his name of the cover of many issues and to make his work the featured cover stories for some. Quite a few of the cover paintings and interior illustrations for sci-fi and fantasy magazines that featured Walton’s stores were done by artists who also worked for men’s adventure magazines, such as Ed “Emsh” Emshwiller, Peter Poulton, Norman Saunders and John Schoenherr. Like many other popular science fiction writers of that era, Walton also wrote for Western, crime, detective and mystery pulps, for men’s bachelor magazines, and for men’s adventure magazines. On Phil Stephensen-Payne’s great Galactic Central vintage magazine site I found that Walton wrote stories for several of the classic Western pulps, like ACE-HIGH WESTERN STORIES, BIG-BOOK WESTERN MAGAZINE, FIFTEEN WESTERN STORIES and RANCH ROMANCES. He also wrote for many of the best crime, mystery and detective magazines in the 1950s, including: ALFRED HITCHCOCK’S MYSTERY MAGAZINE, CRIME FICTION STORIES, DIME MYSTERY MAGAZINE, OFF BEAT, MANHUNT, PRIVATE DETECTIVE, PURSUIT, SURE-FIRE DETECTIVE STORIES and TRAPPED. 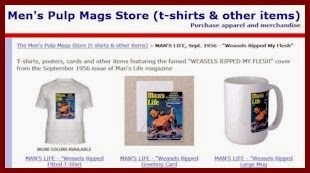 Some of the covers of those magazines also featured artwork by artists who worked for men’s adventure magazines, like Norman Saunders and Wilbur “Wil” Hulsey, creator of the iconic flesh-ripping weasels cover painting that inspired me to start collecting and writing about men’s adventure magazines. After doing some online research, I looked in my collection to see what stories by Walton I could find in men’s adventure magazines, in addition to the one in WILDCAT ADVENTURES. With just a quick search, I found Bryce Walton stories in five different men’s adventure magazines. One is “YOU DON’T COUNT FOR A DAMN,” a gritty World War II story in the first issue of BATTLE CRY, published in December 1955 with uncredited artwork. I found a cave adventure story by Walton, titled “THE DEEP PLACE,” in the May 1957 issue of the top tier men’s adventure magazine ARGOSY, with full color artwork by Philip Ronfor. In the first issue of MAN’S ADVENTURE, published in May 1957, I found a reprint of the BATTLE CRY story with different artwork by another uncredited artist. That artwork is also uncredited but is pretty clearly the work of artist Charles Copeland and is confirmed as his in the Charles Copeland section of the terrific website of paperback and pulp art maven Lynn Munroe. It was the cover story in that issue, which features a black panther cover painting by Clarence Doore. The fact that Bryce Walton stories appeared in the premiere issues of four different men’s adventure magazines suggests that he was known and admired by editors. Now that I’m tuned into him, I will take note of his other MAM stories as I look through issues in my collection. I suspect there are many. Online, I found a couple of short bios of Walton, including a Wikipedia entry. They note that he also wrote scripts for the early kids TV show CAPTAIN VIDEO AND HIS VIDEO RANGERS and for Alfred Hitchcock’s ALFRED HITCHCOCK PRESENTS series. In addition he wrote a number of novels, including: STRANGE ALLIANCE (1947), THE LONG NIGHT (1952), SONS OF THE OCEAN DEEPS (1952), THE PASSION OF ORPHEUS (1954), THE MAN ON THE ISLAND (1958), FINAL EXAM (1964), CAVE OF DANGER (1967), HARPOON GUNNER (1968), HURRICANE REEF (1970) and THE FIRE TRAIL (1974). While searching for his books on Amazon, I saw that several publishers have been putting out reprints of his work. For example, Wildside Press has included some of his mystery and science fiction yarns in the “Megapack” ebook series. The Amazing Sci-Fi Classics imprint has included some of Walton's science fiction stories in their “Golden Age of Science Fiction” ebook series. And the Armchair Fiction company has published a 320-page collection of Walton’s science fiction stories as Volume One of its “Masters of Science Fiction” series. Coming up in the near future: an interview I did with artist Basil Gogos, whose cover painting for the first issue of WILDCAT ADVENTURES got me started on this last series of posts.